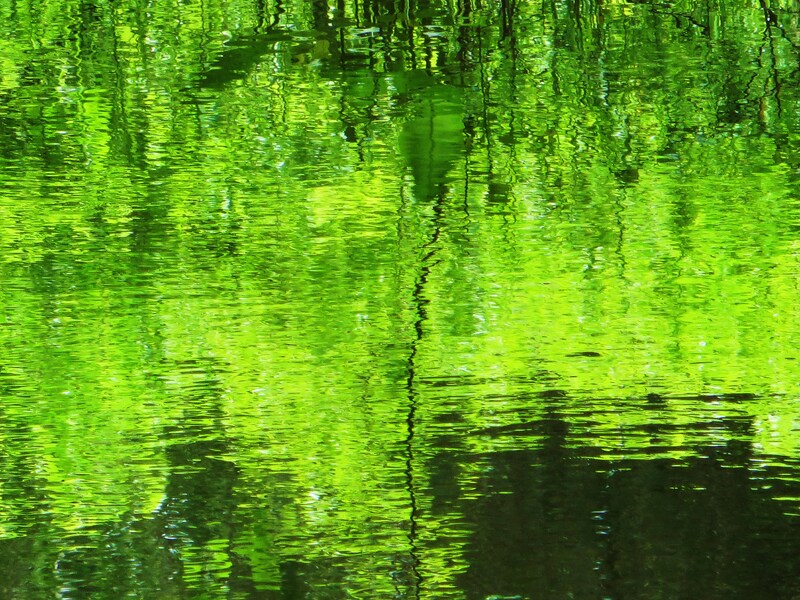 If I add a tiny detour near my office on a windless summer day, a brook provides an extra vista of electrified spring green, a spectacularly dense–if unreal–underwater forest. In more open sections I might be treated to an extra swath of reflected blue and softly undulating white, as if the sky is occupying even more than its own vast space. It may come as no surprise that I gravitate towards images of “extras” which aren’t really there: rainbow reflections and refractions; shadows cast by ornate irises; iridescent raindrop jewels; face-shaped pollen dustings on petals; spaces framed by clouds; creatures hewed from leaf or stone; instants in which winds anthropomorphize flowers that appear to be protectively holding their brethren or holding each other tightly against a storm. Is it a bird? Is it a plane? . . . . It’s Bat-Leaf! An arm around her shoulder? The extras sometimes assert themselves in hard-to-miss fashion: a crossing guard in a bright orange tutu and a kind stranger bearing a bright blue bag; a deer flashing through the darkness, only a few feet away; sea lions merrily photo-bombing my son. Sometimes I don’t notice the extras as I take photographs. Only later do I see the little girl looking in from the outside, the tiny flapper-era face in raindrops arrayed on a rose petal, golden sea creatures swarming among clouds, the strip of bacon in my sunset, a seagull soaring by, the perfectly color-coordinated bright orange sneaker peeking into the frame atop my favorite tulips, vivid primary colors in more muted seas of green. But it’s almost always worth taking the time for an extra look. This entry was posted in Love and Loss and tagged Extra, photography, postaday, Weekly Photo Challenge: Extra. Bookmark the permalink. Love this everyday extras! They are there if we look around… Thank you Stephanie!